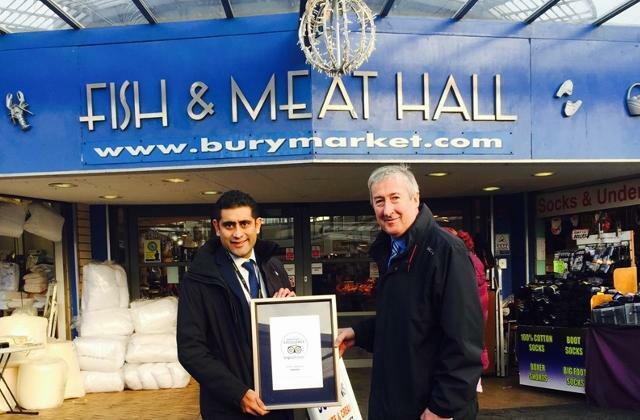 Bury Markets - The latest accolade from the world's largest travel site TripAdvisor. The latest accolade from the world's largest travel site TripAdvisor. The latest accolade awarded to Bury Market has come from the world's largest travel site TripAdvisor. It has given the town's famous market a Certificate of Excellence for 2016 after the tourist attraction achieved a guest rating of 4.5 based on 585 reviews, putting it among the very best. The site also rates it the Number One attraction of 32 in Bury! The Certificate of Excellence is based on the quality and quantity of recent reviews submitted by travellers on TripAdvisor over a 12-month period. To qualify, a business must maintain an overall TripAdvisor bubble rating of at least four out of five, have a minimum number of reviews and must have been listed on TripAdvisor for at least 12 months. Councillor Rishi Shori, leader of Bury Council, said: "We are delighted that so many visitors have given such positive feedback via TripAdvisor and we hope that that will encourage many more people to come to Bury and enjoy our unique market atmosphere for themselves." Heather Leisman, vice-president of industry marketing at TripAdvisor, said: "With the Certificate of Excellence, TripAdvisor honours hospitality businesses that have consistently received strong praise and ratings from travellers. This recognition helps travellers identify and book properties that regularly deliver great service. TripAdvisor is proud to play this integral role in helping travellers feel more confident in their booking decisions." Picture: Council leader Rishi Shori (left) and Bury Markets Manager Andrew Heyes with the TripAdvisor certificate.